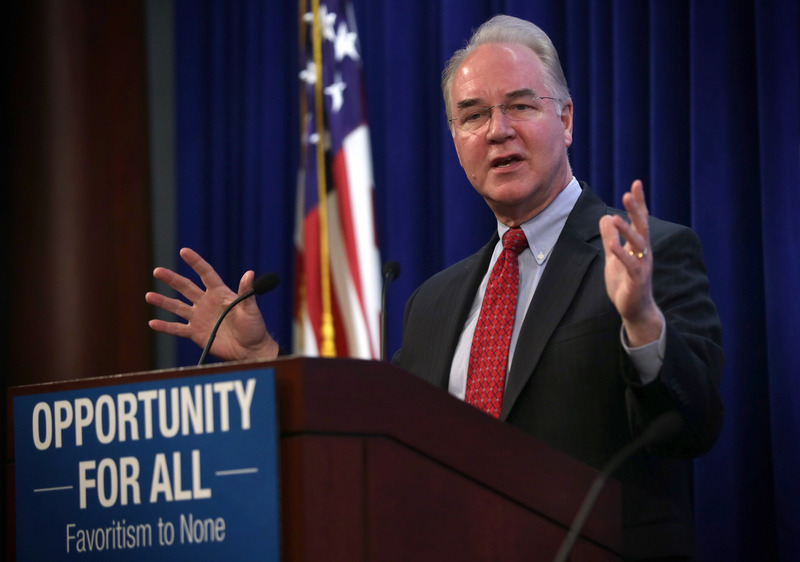 Donald Trump has chosen Georgia Rep. Tom Price to serve as his Health and Human Services Secretary, The New York Times reported Monday. Price has served six terms in the House of Representatives, and has been a staunch critic of Obamacare since he took office. Naturally, this has many people wondering: Will Tom Price repeal Obamacare? Obamacare may well end up getting repealed once Trump takes office, but it won't be Price who repeals it. That's because Obamacare is a federal law, and repealing laws isn't something that Health and Human Services secretary has the power to do. That responsibility lies with Congress, so the law will remain in place until Congress passes legislation rolling it back and the president signs it. That's not to say Price doesn't want to repeal Obamacare. He most definitely does, and has made this clear throughout his time in Congress. Every year since 2010, when the health care overhaul was signed into law, Price has introduced his own competing legislation, which would privatize Medicare, authorize the purchasing of insurance across state lines, and implement a variety of other conservative health care proposals. That said, it is quite likely that Congress will vote to repeal Obamacare once Trump takes office. After all, Congressional Republicans have voted to repeal the law more than 40 times since it passed. There's no reason to think they'll stop next year, especially given that they'll finally have a Republican in the White House who might sign a repeal law. The operative word is "might," however: Personally, I'm not 100% convinced Trump will sign an Obamacare repeal law if Congress sends him one, because I'm not entirely sure he wants to repeal all of it. For all of the law's flaws, it has given insurance to many millions of previously-uninsured Americans, even by conservative estimates, and repealing it would kick an estimated 21 million of their coverage plans, according to the Committee for a Responsible Federal Budget. Late in the campaign, when Trump was attempting to rally support within the Republican party, he came around to the party's orthodoxy on the matter and said he wanted to repeal Obamacare. Earlier, however, he insisted that "nobody's gonna be dying in the street if I'm president," and while that's not exactly a position, it's also not the kind of thing genuine opponents of Obamacare say very often. He's also said on many occasions that, unlike "every other Republican," he doesn't want to touch entitlements, and Obamacare is most definitely an entitlement. Many people have compared Trump to far-right populist politicians in Europe, like Great Britain's Nigel Farage. While Farage and others of his ilk adopt draconian anti-immigration policies and stoke xenophobic, often racist fears of "the other," they often support liberal economic policies, most notably entitlements and domestic welfare spending. Even pro-Brexit forces promised to use the ostensible savings from Brexit to fund the National Institute of Health, Great Britain's state-run health provider. If you believe that Trump is in the same vein as these folks (and there's good reason to believe that he is), then it seems unlikely that he'll follow through with an absolutely full repeal of Obamacare. He may sign some piece of health care legislation that he calls "Obamacare repeal," and it may affect the law in one way or another. But it doesn't seem as though he opposes the law in the same way that a guy like Price does, and it's entirely possible that, when faced with the option of kicking 20 million people off of their insurance plans, Trump will balk.